This entry was posted on Montag, August 29th, 2005 at 00:00	and is filed under best shots, black and white, building, gallery, travel. You can follow any responses to this entry through the RSS 2.0 feed. You can skip to the end and leave a response. Pinging is currently not allowed. tolle s/w-Aufnahme! die Brücke wirkt so wie ein Spielzeug. Great black and white and nice composition. 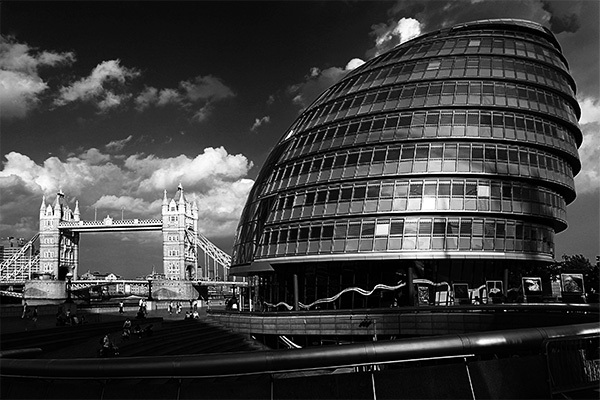 This is City Hall designed by Lord Norman Foster’s architectural practice: Foster and Partners. The bridge in the background is Tower Bridge. This is an excellent photograph with a great composition. Sehr schönes Bild! Da stand ich auch schon öfters.